There is a lot to see in the area surrounding Khanom. 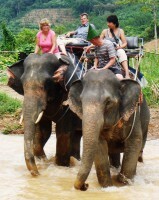 You can experience the traditional Thailand, unchanged from how it was in the past. Go to Khanom’s huge harbour area and watch the discharge of the colourful boats, look how the women are sorting the fish and peel the fresh shrimps. Go on a boat tour with us and watch the dolphins chasing and catching fish around the boat. Learn all about rubber trees, how they grow, how to cut them and how the outcoming liquid becomes latex. Visit a dragon fruit farm with the beautiful flowers and the unusual fruits. 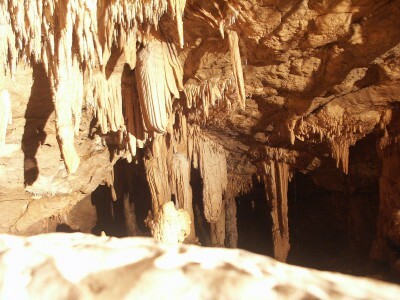 The cave is about 9 miles away from the city and is one of the most awesome caves of the province. The cave has many large and small chambers, each with stalagmites and stalactites of odd sizes and shapes, like pagodas, dinosaurs, custard apples, and fried eggs. Some chambers can only be accessed by crawling or climbing, making it fun for visitors. To get there, start from Khanom district office, turn right at the intersection to Don Sak and take a left turn. The entrance has a bus stop called Sala Tansakun which is easily noticeable. Drive for 6 kilometres until you reach the cave. Visitors must first obtain the cave key from the keeper at the cave entrance. 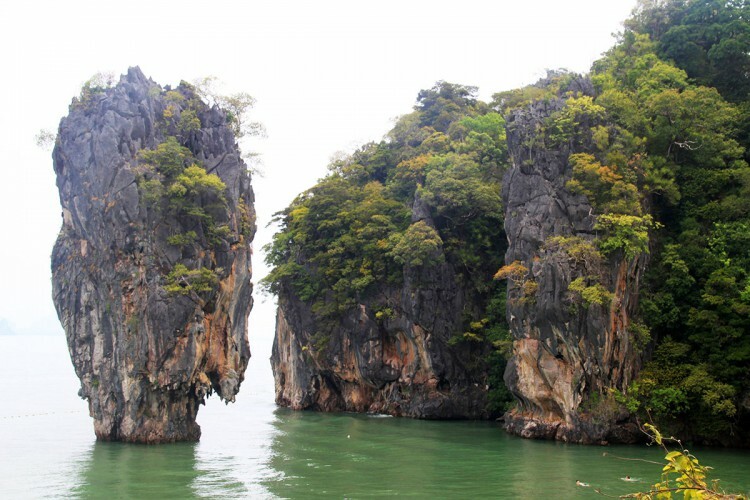 Go into the caves of Khao Wang Tong alone, without other tourist groups. The most impressive thing is the beautiful landscape that captivates you with its pleasant tropical charm. 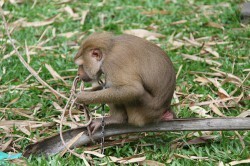 Let us take you to the monkey training center, where monkeys are trained for 6 months to pick the ripe coconuts. You may do a one-day trip to the island of Ko Samui. A regular ferry service takes you to the island of Ko Samui (about 20 km away) with a wonderful golden Buddha overlooking one of the beaches. The island has much more to see, what makes it worthwhile going on a one day trip there. The boats of Seatran Ferryline leave the pier in Donsak every hour from 6 am to 6 pm and go directly to Nathon, the biggest town on Ko Samui. The crossing takes about 1 1/2 hours. The boat back leaves Nathon also on the hour. Raja Ferry will also leave Donsak at the hour and go to Lipanoi, their harbour 4 km east of Nathon. The towns of Surat Thani (next airport) with its canals and Nakhon Sri Thammarat with some of the most beautiful temples of southern thailand are worthwhile being discovered. 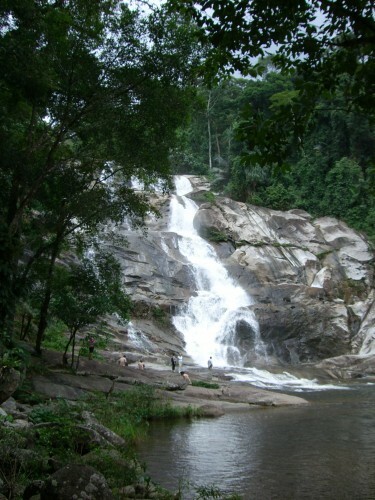 The Khao Luang National Park with one of the most beautiful waterfalls of Thailand can be visited on a day tour. Get to know the south of Thailand by traveling around. Hike through Kao-Sok-Nationalpark! After the experience of elephant riding in the day you can watch the wild monkeys coming to the watering place and playing around in the evening. You can stay in tree houses in the jungle. At the west coast in Pang-Nga Bay typical longtail boats take you to James-Bond-Island passing picturesque villages built on wooden piles in the sea . 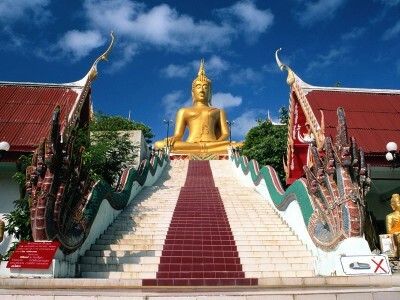 You could go to Phuket Island the most touristic place of Thailand to see Chinese temples or just stroll around.